OVERKILL's The Walking Dead is a four player co-op shooter from the makers of PAYDAY: The Heist and Payday 2 based on the Image Comics series - not the AMC television show. Players step into the boots of one of four characters (plus two additional unlockable ones, and more coming in the future) that were designed with the help of creator Robert Kirkman. They are even officially part of the comic book canon. The game features a world map based in an overrun Washington D.C. and there are (sort of) ten story missions available at launch, comprising Season 1 of the game. An additional nine missions will launch with Season 2 in the near future. OVERKILL's The Walking Dead not only needs that extra content, but it needs vast improvements across the board. The theme of the game is to survive by gathering supplies and avoiding or fighting off undead walkers, and the even greater threat of incredibly well-armed humans - known as The Family and The Brigade. Your base camp is literally that, a place that players must supply (there's an upkeep cost that goes up the more upgrades you have) through gathering resources on missions, a place where the playable main characters and saved survivors reside. Three of the ten story missions involve defending this camp. OVERKILL's The Walking Dead sees players not only progress through leveling up the protagonists through their unique skill trees and gear, but by upgrading the camp hub area, and its work stations (Depot, The Range, Radio, Clinic) accordingly. The support character Maya for instance, serves as a medic and can drop down health for her teammates during missions, and she benefits from upgrading the Clinic at base camp. AI Survivors rescued on missions can be assigned to serve at that work station, providing overall bonuses for the player. It's an interesting meta layer and gives players a few things to manage. 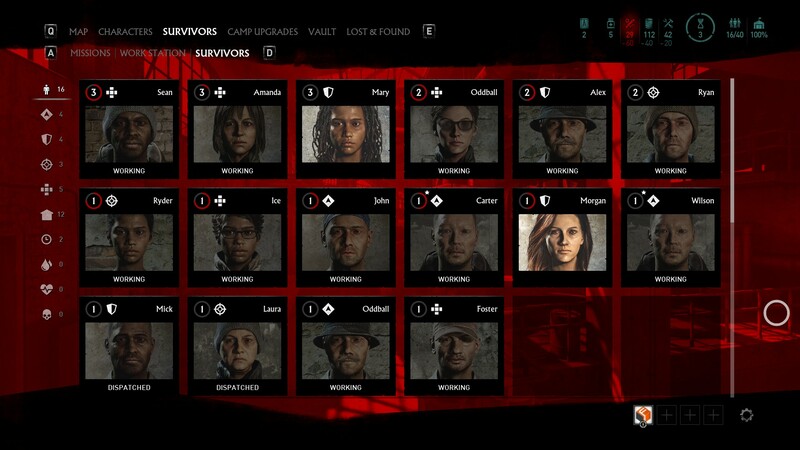 The survivors come in different archetypes like the playable characters do (tank, scout, etc.) and there are missions they can be sent out on similar to how some Assassin's Creed games let players end out assassins on missions in the background to level them up and gather resources. 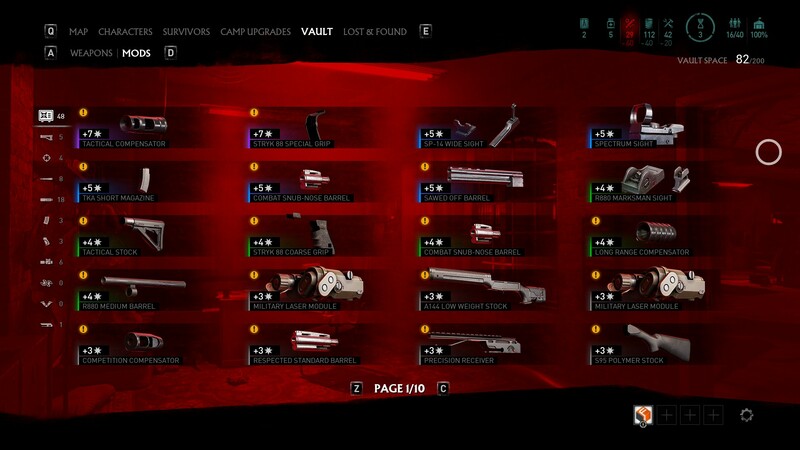 On paper, there are a lot of neat ideas in OVERKILL's The Walking Dead and it aims to offer a lot to players without doing any of the core ones well. Even with the camp system, all of the NPCs are lifeless and static and players are forced to go here in between story missions to "talk" to the camp leader to get the next mission to pop on the map. There's an NPC who sells items here too but they're all useless, and the same can be said for the broken bounty system. Add in super slow load times and the awful camp defense missions (where all the gates are inexplicably open) and the experience of just getting to play is draining. The main gameplay loop involves playing the different missions repeatedly through familiar environments, to acquire loot and XP, and to do it again. You'll need to a few times even to level up and succeed in beating later story missions since most of the gear on first playthrough is so underpowered. The trick, it seems, to mastering OVERKILL's The Walking Dead it to try to defeat the game design and mechanics and not die to its bugs. Playing solo or with a small group, you can queue up and hope for higher-level players to carry you through. And at the end of each mission, you'll get XP to level up your character (each level comes with skill points to spend) and ideally, better gear. Weapons can drop with different types of mods that can be applied. Almost universally, you'll want ones where a suppressor can be equipped since stealth is key to the game, even if the suppressors break almost immediately. During more difficult missions, you'll find yourself waiting a very long time on top of tall vehicles for downed allies to respawn or for timer-based events to occur. And sometimes you'll be trying to jump along other high objects to cheese your way to the finish line (extraction via truck) which would fit the lore if the environmental objects and invisible walls weren't so inconsistent. During missions there's a noise meter at the top of screen, where gunfire, explosions, traps, radios, car alarms, etc. all add to it. This meter has three levels to it, each new level increasing the amount of infinitely spawning walkers. At max level, the "horde" comes and it's extremely difficult to move around and complete objectives. Ammunition is scarce, weapons are weak, and melee combat isn't efficient enough to deal with them all, so it becomes a game of trying to defeat the janky movement controls to dance around or climb around the environment to complete objectives and escape. The goal is to keep silent of course, using melee primarily but there will be unavoidable shootouts with human enemies which skyrockets the noise meter, and on the most challenging difficulty level (OVERKILL), the meter autofills up anyway. Some of the playable characters have tools to help do specific things during a horde, from deploying smoke or flashbangs, to molotov cocktails that can burn a horde. What holds the gameplay back is the combat and stealth mechanics aren't good. They're clunky like the basic controls. Weapons don't feel great and you're either way too weak, or when you get a good weapon, then it becomes almost too easy. There's no middle ground it seems. 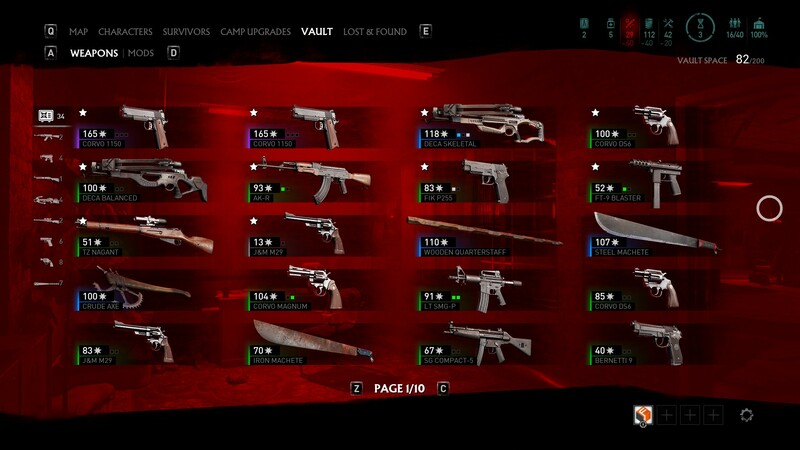 If you can manage a complete playthrough of the story missions, by then you'll have higher level melee weapons that can one-shot walkers, and in the late missions or more difficult variants, you're going weapons free anyway so suppressors don't matter and you can just pick whatever gun your character is proficient at and fire away. That is, if you don't get disconnected. It's not uncommon to have a full on crash/disconnect, and it's incredibly common to have matchmaking timeouts and error codes. In fact, in every mission you'll have lag and framerate freezes which seem emblematic of the overall status of the game. OVERKILL's The Walking Dead plays and feels like an overpriced early access title. The console versions were delayed until 2019, but the PC version that's available seems half-baked. OVERKILL's The Walking Dead is not casual or new-user friendly. It lacks tutorials or clear information, and has substantial interface woes. You may not even know you can do some of the things you can do for the first few hours of play because the game doesn't tell you. Worse, the gameplay up front is too difficult and that's because the game is designed to make you panic and suffer. It's quite fitting given the theme and source material, but OVERKILL's The Walking Dead takes it too far with some design decisions that break logic. Being tactical and stealthy to clear out an area doesn't work in the long run, because even in a closed off areas, more walkers appear. It's a constant war of attrition which doesn't work because the experience of combat isn't fun. So much of the gameplay involves using melee weapons where there's little to no variety, and certainly no control over how you attack other than click or hold down for a more powerful swing. There are a variety of weapons on this front however, which offer different effects and animations (blades decapitate better but blunt weapons can push enemies back or hit multiple at once). 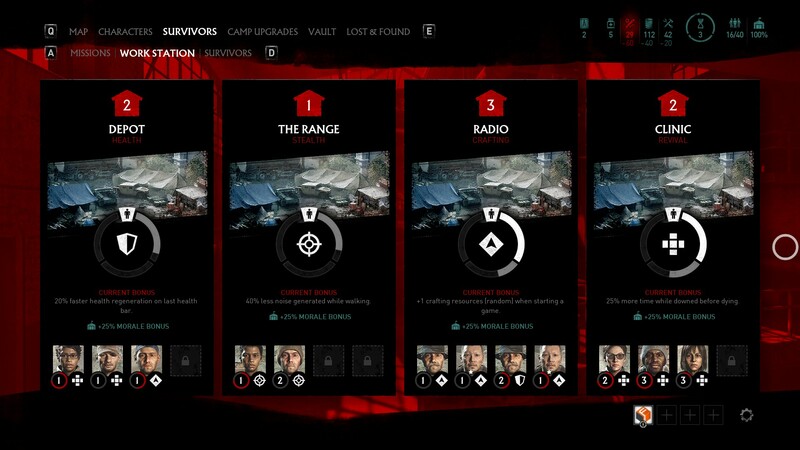 The war of attrition during missions applies to the meta layer of the game, maintaining your camp/hub and keeping survivors happy. Ammunition is valuable, resources are important, and loot you pick up during a mission can be used to craft supplies on the spot - including items (wire cutters, lockpicks, etc.) that help open loot boxes or locked off areas. Enemy AI human characters loaded with weapons and gear don't drop any of these things and don't react to players or walker AI correctly. Sometimes they can dodge bullets, other times they'll walk in front of you without noticing you or just let walkers creep up on them. Sometimes they'll see and shoot you through solid objects. The gun battles are terrible in OVERKILL's The Walking Dead. Little things like firing modes can't be selected on automatic weapons, mod descriptions don't explain what weapons they can fit on, and the inventory vault deletes inventory without informing players or giving them the choice. Zombies can sometimes vanish or teleport while running. Objects can sometimes just float in space, and other times mission items like keys can vanish entirely. That, like a disconnect, means players get nothing for their time and must restart the mission from the beginning. Limited combat and movement controls, and inconsistent rules on what can be climbed and what cannot add to the problems of the basic gameplay. AI on the walkers attacking enemies works well, and the effect and visuals of a horde invading is spot-on, especially with the variety of zombie types and how some can be dismembered and crawl around or be missing parts of their body and face due to damage inflicted by players. Outside of the errors, performance issues in the current version of the game, and clunky controls there are basics inexplicably missing too. OVERKILL's The Walking Dead doesn't support in-game voice or ultra-wide screen monitors. There's fun to be had in OVERKILL's The Walking Dead once you get over the hump, especially when succeeding in a mission, finding cool new loot, or just playing co-op with a good group of communicators. Most of the experience is frustrating and at times, unfair. And it's rare to play a mission that doesn't have some performance issue or glitch. There are thankfully no loot boxes or microtransactions of any sort, meaning no crazy cosmetics that don't fit the aesthetic of The Walking Dead universe, but this doesn't help justify the expensive $60 price tag since the game is buggy and desperately needs more content and fixes. OVERKILL's The Walking Dead tries to do a lot of things, but doesn't do much particularly well, or to completion. It wastes player's time and forces them through a partly broken grind with little reward. With updates and content, this could be good in the distant future but it's not ready for retail yet. More: What is Going on in The Walking Dead TV Series? OVERKILL's The Walking Dead is available on PC via Steam and releases on PlayStation 4 and Xbox One February 2019. Screen Rant was provided PC codes for review.